I have been waiting to make this post. I am an enormous fan of the Japanese furnishing known as a kotatsu. I own two of them - one big, one small; one is sort of formal and classy-looking for guests, and the other is pink-topped with a big fluffy polka-dot blanket, just the way I like 'em! There is no possibility that I overdid it on the pink. None. I also keep a third one at my boyfriend's house, you know, just in case. Technically I bought it for him. Technically. My fascination for kotatsu started well before I actually arrived in Japan, though I can't quite remember where from. (Possibly even Ouran!?) I'm anemic and have low blood pressure as well as poor circulation, so I'm literally cold All. The. Time. I fell in love with the idea of kotatsu long before I had ever laid eyes on a real one - and no surprise, when I finally had one of my own, I was hooked. So just what is a kotatsu? A kotatsu is a table that has a small electric heater built into the underside, and a removable tabletop. Cheaper kotatsu are often made of plastic and are light and easy to store, but classic wooden ones are still very popular. A square blanket - often two of them - is placed between the frame and the tabletop. A person then sits on the floor or on a cushion with their legs under the table. Originally, the intent was that the heat would enter through the bottom of traditional Japanese robes and exit at the neck to effectively heat the entire body - since Japanese houses depend largely on space heating and most are not insulated effectively (if at all! 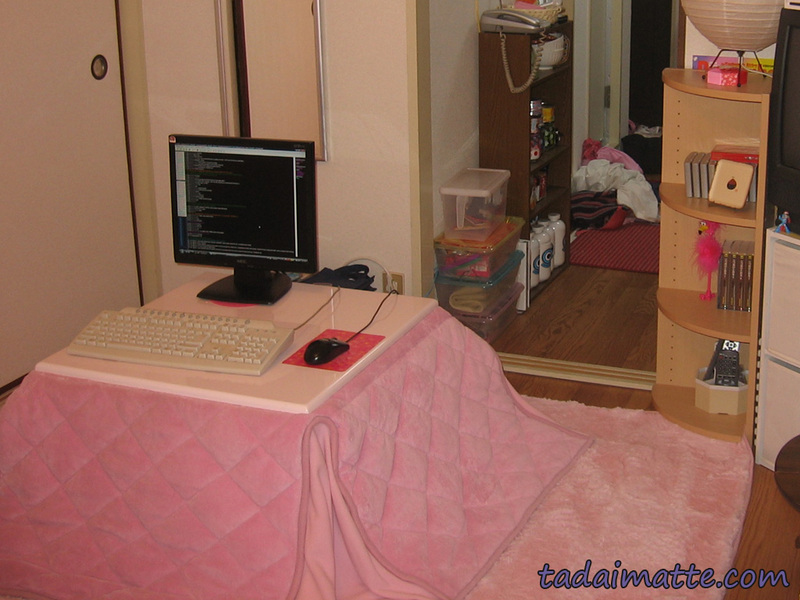 ), a kotatsu is a cheaper way to stay warm in an inadequately-heated room. It has come to be symbolic of family life and domesticity, as families still gather around the kotatsu on winter evenings, and is a comfortable spot to read, eat, or nap on a cold day. In the summer, the blanket and electrical cords are removed, and the kotatsu becomes a normal coffee table. Kotatsu have their origins in the Motomachi period, the 14th century. The cooking hearth, irori, was used for heating as well as cooking and fuelled by charcoal. Over time, the irori was adapted to have a seating platform, and eventually, a quilt, which trapped the heat coming from the burner. This was called a hori-gotatsu. In the Edo period, the concept was adapted into a square shape with the wooden platform encircling it. a zaisu; a legless chair. Cushions also work! The visual style of the kotatsu we know now came about with the use of tatami mats in homes. The charcoals were kept in a earthen pot on top of the tatami - this style is known as the oki-gotatsu. Electricity eventually replaced charcoal as the primary heating source, and the electric heaters came to be attached to the underside of the table. This is the type of kotatsu used in modern Japan today, and I doubt I would be exaggerating much to say that just about every household has at least one - in fact, we even had one at my school, in the resting room, and on the cold winter days when the students were off for New Year's break, I almost always chose to spend the day there rather than at my desk by the (open!) window. That was my kotatsu, I decided. I bought the one on the left, choosing a pink lacquer tabletop. The glass top was so inviting, but I knew I would be shipping the table home at the end of my contract in Japan, so I decided not to take chances. (Good thing - my table actually suffered shipping damage obvious enough that a glass top never would have survived!) I had a fleece blanket like the ones above, but later got a more traditional square one with a removable, washable cover, with the intent being that someday when I furnished a living room that wasn't entirely pink, I could sew a new cover for the blanket and make a new table-cover in a more vanilla sort of colour. As it turned out, upon arriving back in Toronto, I was lucky enough to be able to actually buy a bigger (double the above size), chestnut-coloured wooden kotatsu from a family selling theirs on Kijiji. It's the perfect size for guests, and I improvised with a twin-sized kakebuton for the blanket. I've watched Kijiji since, with an alert on the word kotatsu, but I've only seen two pop up in the year since I've been in Toronto. That does mean that having your own kotatsu isn't necessarily going to be easy - the cost of importing even a cheap one is rather steep. I've seen guides to building your own online, which may be a good bet if you have the woodworking skills and the confidence to work with the heating element. (The heating elements themselves can be bought online as well!) A word of caution, though: I asked at the electronics shops in DenDen Town what needed to be done to take my kotatsu home to Canada with me, and he recommended a step-down transformer (it weighs at least 10 lbs!) 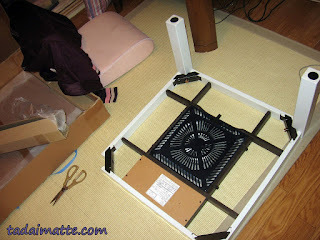 for safety and to prolong my kotatsu's life, since using any appliance on the wrong voltage will wear it out faster. It was actually pretty tough to find the correct adapter, even in DenDen Town, because most Japanese appliances will work in Canada/the U.S. just fine. In the case of a heater, though, you want to be safe rather than sorry! I've seen these transformers for sale at Mits here in Toronto, or you could probably pick one up online. 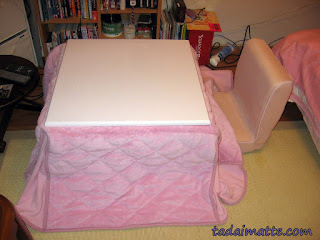 a non-pink kotatsu looked like! 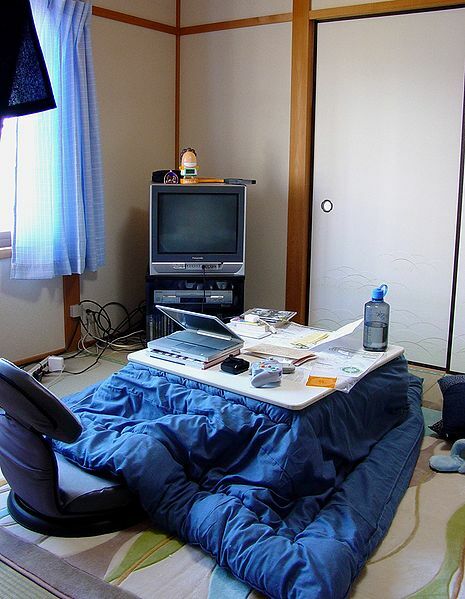 You can also buy yourself a kotatsu and the accessories online, of course. J-Life is based in the U.S. and they sell elegant, classic tables. Rakuten, on the other hand, is a little harder to purchase from (watch out for that shipping!) 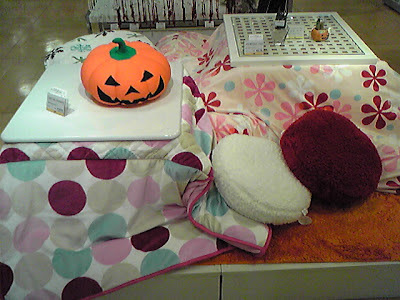 but they have colourful, modern kotatsu and kotatsu-gake. Personally, I like all types - the classic wooden style, the colourful tabletops and blankets with a ton of "pop," and even the lightweight retro plastic ones like the table we had at school. It was very 80s, like the rest of the room, and that was one of the things I loved about it. So, are you ready to settle down for a cold winter under the kotatsu? I've found my perfect method: a puzzle mat (for comfy sitting and laying down) with a nice fuzzy rug laid over it. 100x100cm table with adjustable height extenders. Downy, fluffy kotatsu-gake blanket with a washable futon cover so I can change out the patterns and colours as I want them. Heat turned on a nice medium-low, and a small zaisu legless chair with padding on the back. A cup of tea. Earl grey - hot. Maybe a nice pot of sukiyaki, too!